Los Angeles Rams running back C.J. Anderson scores against the Dallas Cowboys during the first half in an NFL divisional football playoff game Saturday in Los Angeles. LOS ANGELES — With 1 yard between the Los Angeles Rams and the Dallas end zone on fourth down midway through in the fourth quarter, Sean McVay decided to go straight ahead. C.J. Anderson ran directly into the left side while his line cleared a path. He tumbled into the end zone with 7:16 left for the Rams’ final points in their first playoff victory in 14 years, 30-22 over the Cowboys on Saturday night in the divisional round. Los Angeles’ ground game is something to be feared after racking up a franchise playoff-record 273 yards rushing from the opening drive to Anderson’s final first-down run. That’s also the most ever allowed in the postseason by the five-time Super Bowl champion Cowboys, who were playing in their NFL-record 63rd postseason game. 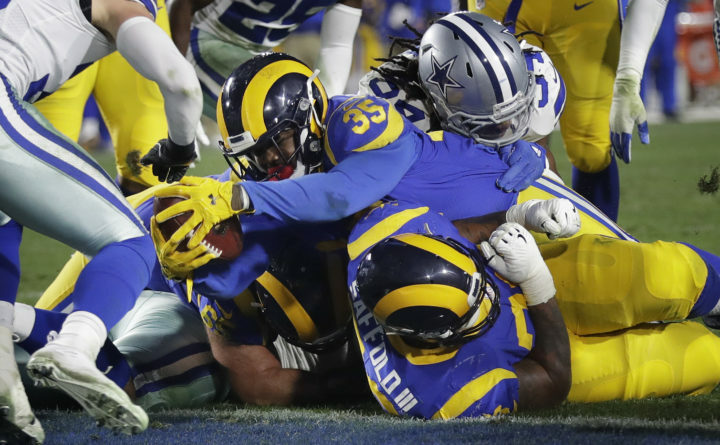 With the Rams’ veteran offensive line cutting holes in the Cowboys’ defense, Gurley and Anderson became the fourth set of teammates in NFL history to rush for 100 yards apiece in a postseason game, an improbable development just a few weeks ago. Gurley is the Rams’ offensive centerpiece and one of the NFL’s elite running backs , but Anderson is a well-traveled veteran playing only his third game with the Rams after signing last month when Gurley was struggling with a knee injury. The Cowboys (11-7), who largely shut down Seattle’s league-best rushing attack last week, hadn’t allowed two 100-yard rushers in a playoff game since the NFL-AFL merger. Los Angeles racked up more yards than the Cowboys had allowed on the ground all season. Elliott rushed for a TD and Amari Cooper caught an early TD pass for the Cowboys, who still haven’t won a playoff game on the road in 26 years. After winning the NFC East and beating Seattle last week, Dallas lost in the divisional playoff round for the sixth consecutive time and fell short of its first trip to the NFC championship game since January 1996. Dak Prescott passed for 266 yards and rushed for a TD with 2:11 to play, but the Cowboys couldn’t climb out after falling into a 23-7 hole midway through the third quarter. Elliott managed only 47 yards on 20 carries as Dallas lost for just the second time in its last 10 games. Elliott scored on a 1-yard plunge and the Cowboys got a 2-point conversion to trim the Rams’ lead to 23-15 in the third quarter, but the Rams made a decisive 12-play, 65-yard drive in the fourth capped by Anderson’s bold 1-yard TD plunge on fourth down. Three years to the day after the NFL approved the Rams’ return to Los Angeles, and two years to the day after McVay was hired, the franchise earned its first playoff victory since coming home from 21 years in St. Louis. A sellout crowd of 77,187 assembled in the cavernous Coliseum, and a significant portion of those fans cheered on America’s Team. The sideline was dotted with celebrities, and LeBron James hosted several Lakers teammates in a field suite behind the east end zone. Rams: Gurley appeared a bit hesitant early in his first action in four weeks, but his knee seemed to hold up well. … CB Aqib Talib went to the locker room in the third quarter to be evaluated for a concussion. He returned for the fourth quarter.